If you’ve ever been to Sweden or Finland, you’ll probably be familiar with the licorice candies called “Salmiak” or “Salmiakki”. These flavorful yet bitter candies are unique because they use Sal Ammoniac, also known as Salt of Ammon, to give it that special salty finish. In fact, Scandinavians are so in love with these Salmiak candies that they have been known to drop a handful into a bottle of aquavit or vodka to make a bitter salty licorice liqueur. With that in mind, we set out to create a liqueur that takes the salmiak flavor profile and merges it with a classic Fernet to create a new bitter that is familiar for lovers of Fernet and Scandinavians as well! As is tradition when making Fernet, the bitter starts with a pinch of saffron and a healthy dose of aloe for bitterness. We then add in licorice root and sal ammoniac along with a bit of anise and chicory. 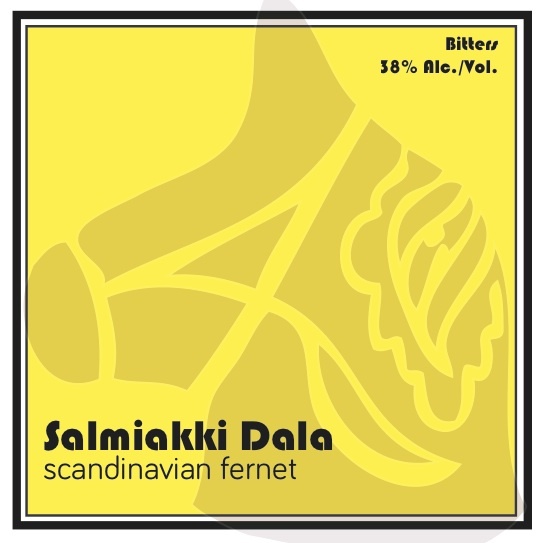 In total, 10 different botanicals are macerated together to make the Salmiakki Dala. We then dilute the spirit and finish it with a touch of caramel for color and beet sugar for balance. Contains caramel for color and sal ammoniac for flavor.